Be strong and courageous. 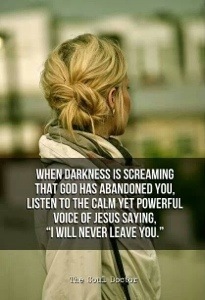 Do not be afraid or terrified because of them, for the Lord your God goes with you; he will never leave you nor forsake you, Duet 31:6. The words of Deuteronomy 31:6 are so comforting to my soul. I don’t know about you, but life has dealt me some challenging circumstances. In hard and challenging seasons one of the greatest temptations presented to us is to run from God instead of to Him. The problem with the whispers of the enemy is that he’s a liar. God’s goodness and love are not determined by our circumstances. Love is who He is. Goodness is an attribute of His character. Jesus already overcame the world and our greatest enemy death! God doesn’t remove every challenge from our lives. Why? I can’t answer for everyone. I can only give you some insight from scripture and my own life. 1. Delay isn’t always denial. Sometimes the manifestation of our prayer requests or God’s promises don’t immediately surface. Think Abraham and Sarah, Hannah, Mary and Martha for Lazarus…the answer to their prayers didn’t immediately surface. God’s timing isn’t always our timing. 2. God’s no runs deeper than what we see on the surface. We see in part and know in part. God sees every detail and though it hurts at times, we have the choice to trust Him or not trust Him. 3. God promises to never leave us in the midst of challenging circumstances. The greatest intimate moments I’ve had with God have been during seasons of great pain. Jesus was the only One I felt safe enough to talk to or confide in, and He’s safe. Also, Jesus doesn’t mind our tears! He isn’t put off by brokenness, pain, or the hurting. He’s not too busy or too important in His own eyes to reach low to raise us up high. The enemy has been defeated, it’s our responsibility to recognize he’s not bigger or more powerful than God, yet he attempts to bully those God loves. A friend gave me a helpful analogy once. A surgeon and a butcher both cut things open. The butcher to kill. The surgeon to heal. God is the master surgeon! The devil is the butcher. For those who use the life of Jesus as a model for suffering; note, Jesus’s death was for a reason, purpose, to save the lives of many. Many people believe their horrible circumstances are from God, when they may not be. I hope these points encourage you to run to Jesus instead of away from Him. He’s suffered in ways we could not imagine. There’s no one who knows how you feel and how to heal like Jesus!